At The Sportsphysio.com Sports and Performing Arts Injury Clinic, manual skills are always at the forefront, with treatments tailored to suit the individual. An extensive range of electrotherapy equipment helps to aid diagnosis and treatment, including ultrasound, interferrential, microcurrent and laser. Expert biomechanical assessment, gait and postural analysis techniques are employed where necessary. You do not need to have a sports injury to benefit from sports therapy treatments. Some of the soft tissue techniques are excellent for alleviating the symptoms of other conditions such as Fibromyalgia or Chronic Fatigue Syndrome, whilst the specialised technique of Manual lymphatic Drainage is very helpful to those who have had lymph glands removed and is often recommended by surgeons following surgical intervention or liposuction. You may have undergone recent hip or knee surgery and need to make sure that you achieve optimum rehabilitation. Temporomandibular Joint Dysfunction / Syndrome (TMD). As each condition and person is different, it is difficult to tell how many treatments may be required. However, generally three or four sessions is sufficient and some people may only need one. Your initial consultation may take a little longer and can last about 45 to 60 minutes. Follow up treatments are 30 minutes. Do I need to be referred by a Doctor? You do not need a Doctor’s referral to attend for assessment or treatment but sometimes it may be necessary to refer back to them if NHS medical imaging or consultant referral is required. If you have private health insurance, they may require a referral or signed form by your Doctor in order to authorise reimbursement of treatment charges. Does my Medical Insurance cover the treatment? Our treatments are recognised by many insurers, but policies can vary and it is always wise to check with them beforehand. You will need to be insured for Sports Therapy treatment or Alternative therapies. Being insured for Physiotherapy is not always an indicator that our treatments are covered. 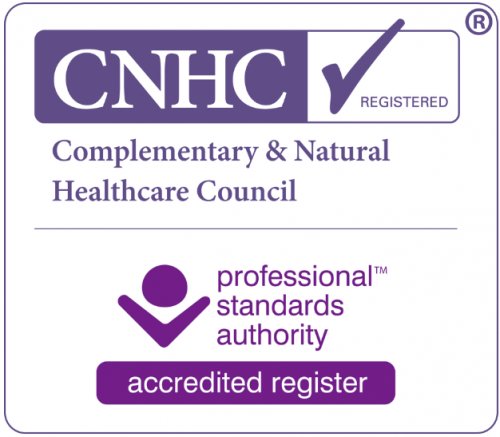 Your Sports Therapist is registered with the CNHC (Complimentary and Natural Healthcare Council) and the CThA (Complimentary Therapists Association). Health & Care Professions Council. We currently do not offer the services of a HCPC registered physiotherapist at the Sport & Performing Arts Clinic. Will you contact my doctor? Subject to your approval we can communicate where necessary with your GP or consultant. We pride ourselves on our professionalism and if we feel this type of treatment is not right for your condition we will refer you to your GP or Consultant. Can I see a private consultant? Yes. We have direct arrangements with some of the North of England’s leading specialists and imaging centres. As sports injury practitioners, the demanding nature of sports and footwear limitations, makes for a challenging combination when prescribing orthotics. Shock attenuation, functional control and support has to be able to be provided whilst maintaining flexibility with durability. We at the Sportsphysio, have spent many months appraising manufacturers of orthotic devices and have found a range that can provide all of this, along with a high level of service and exceptional quality. Rightstride manufacture state of the art orthotic devices and offer us the complete range from “ready to wear” to bespoke, custom build devices.